​Maddie calming down with Franklyn at an event. 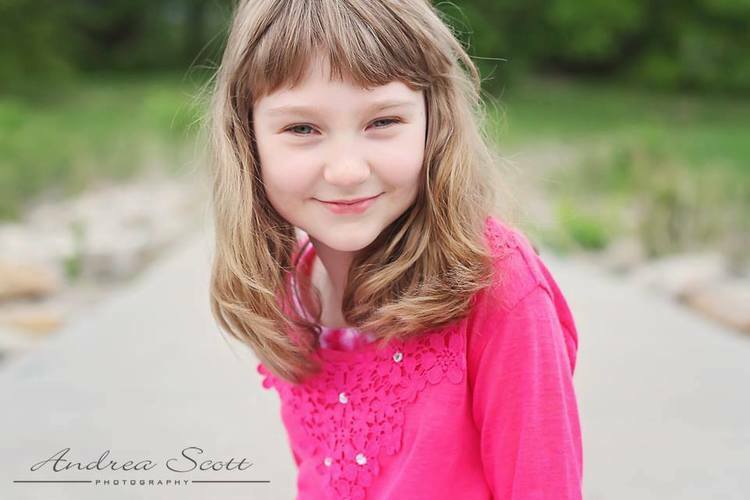 ​Maddie Grace (or Maddie “Amazing Grace” as we like to call her) was diagnosed with classic autism in 2008 when she was 2 years of age. She is a beautiful, silly, intelligent girl with limitless perseverance and potential. Maddie has received countless hours of various therapies since she was first diagnosed and will continue to require therapy and support throughout her life. She is currently receiving weekly speech, occupational, and music therapy and has also regularly participated in therapeutic horseback riding. Maddie is a hard worker and has made great progress in many areas, most notably in her verbal communication, but she continues to struggle with academics, motor planning, and independence in daily living and self-help skills. She enjoys being around kids her own age but has limited ability to communicate and initiate in play with them. Maddie also experiences anxiety in new settings, environments that are sensory over stimulating, and whenever there is a lack of structure or routine. Our outings require a lot of planning and flexibility and we must always be prepared for fast exit wherever we go. This can be very stressful for our family and often requires us to inconvenience our extended family and friends. This has also really limited Maddie’s opportunities to play and engage with children outside of school and form friendships which is heartbreaking for us. Our approach with Maddie has always been as long as it’s not going to hurt her, let’s try it and see if it helps. We will do whatever it takes to give Maddie the chance she deserves to grow, to learn, and to heal. Besides Maddie’s love for music, animals have always been something that she has responded to enthusiastically without fear or inhibition. A dog was something that we had considered for Maddie but we knew it couldn’t be just any dog. It had to be a special dog that could remain calm when Maddie had a meltdown or was unintentionally rough. Up until a few years ago we never even knew that there were service dogs trained specifically to work with individuals on the autism spectrum. We were very excited to discover Paws 4 Autism through our local Autism Society chapter connections. The dogs that are trained and provided through this organization are just what we need for our Maddie. 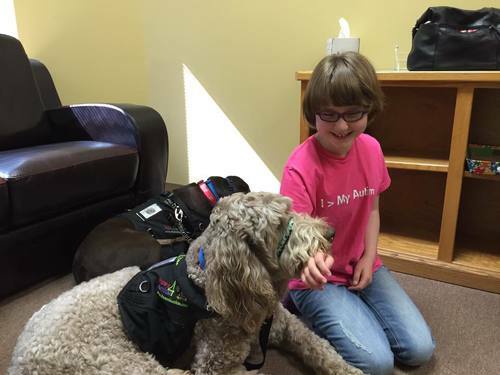 We believe that and autism service dog will increase Maddie’s independence and confidence by reducing her anxiety, providing encouragement and comfort, teaching her how to be responsible and care for a being other than herself, and ultimately fostering social bonds with other children. The dog would go everywhere that Maddie goes, including school, and we are very blessed that her school has openly embraced the opportunity. As Maddie emotionally and developmentally grows through use of an autism service dog, our family will also be able to experience a sense of freedom that we never thought possible. As you can see, these are amazing dogs that require a lot of training to work with special children like Maddie. The cost of caring for and training these dogs is more than most families like ours, who have spent thousands of dollars on therapy and special diets, can afford. We need your help to make this possible for Maddie and to improve her (and our) quality of life. Please do whatever your heart leads you to in helping us to raise the funds required to bring one of these wonderful dogs home to help our beautiful Maddie Grace reach her full potential. If you are local to KC you probably heard about the therapy dog Meeko who was shot in the head during a burglary of his home. So pleased that with the amazing care of Deer Creek Animal Clinic and VCA Animal Hospital that he is doing great and returning home! Meeko's family found out about Maddie through their VCA visits and have publicly announced their desire to pay it forward after receiving an outpouring of support. They are diverting further donations and encouraging others to donate directly to Maddie's service dog fund!! I was in tears when VCA called me and told me about the incredible generosity of this family. Good will always triumph over evil! God bless the Kirwin family! Our first batch of t-shirts is almost gone!!! If your size is no longer available, PLEASE check out the PAWSWEAR order page for one of the black shirts...and select Maddie Ray as the family to benefit! DISCLAIMER--We will get the inventory of Maddie's shirt updated by this evening (10/14/15) IF we are out of stock of the shirt you order you will be given the option of a refund or a replacement with a black PAWS shirt. MADDIE GRACE IS FULLY FUNDED!! !